It’s no secret that my love for Mexican and slow cookers runs deep. Combine the two and well, you can just imagine how excited I am about what’s happening here. Especially when I come home starving after a hella hectic Monday at work, a seemingly weekly occurrence around our house. The literal translation of carnitas is “little meats” (does anyone else find the single dish with a plural name thing confusing, too? ), a Mexican dish traditionally made by braising and then frying pork either in oil or lard, giving it that fall-off-the-bone tenderness with a crispy finish. While that all sounds totally lovely and utterly delicious, that’s not something we can (nor should) eat on the reg so I made a healthier version: chicken braised in a simple combo of OJ, lime juice and a few spices to tenderize and flavor the meat, and then briefly broiled for a still crispy but not-fried finish. Three words: Who. Needs. Pork. Ok, six: Fried. In. Oil. So that might be a bit dramatic (because legit carnitas are indeed ridiculously amazing) but for what it’s worth to your waistline, the slow cooker–broiler combo is pretty darn good too. The citrus juices and spices leave behind so much flavor. 1. They’re stupid easy. I kid you not–they pretty much make themselves. It took 5 minutes to get everything into the slow cooker and 10 minutes to brown them in the skillet. The rest of the time was hands-off, taste-testing and photo shoot aside. 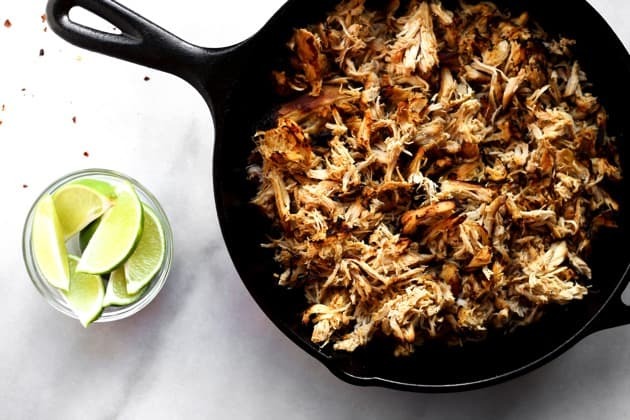 Basically, you need these chicken carnitas in your life. And your belly. I’d give you some of mine (ours?) but the hubs and I have a burrito bowl in our future this evening and there just isn’t (aren’t?) enough. Enjoy! In a small bowl, combine minced garlic and all of the spices. Rub chicken, first with olive oil and then spice mixture, and transfer meat to slow cooker. Add orange, beer and lime juice, cover and cook on low for 6-8 hours (or high for 3-4 hours.) Remove chicken from liquid and shred (two forks works well–but fingers work great if you have time to let it cool first), reserving the liquid. Set broiler to high with rack in center of oven. 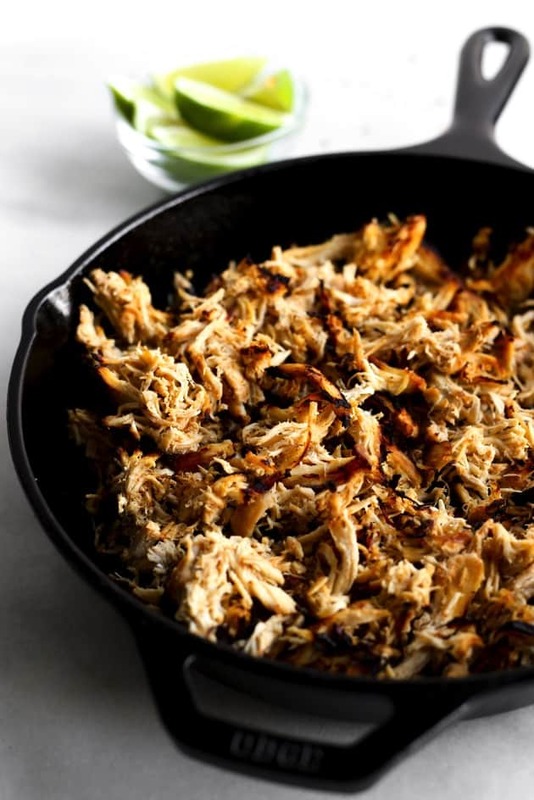 Transfer shredded chicken to a broiling pan, adding back 1/3 cup of liquid to meat and broil for 5 minutes on high. Remove pan, add another 1/3 cup liquid and stir (or flip) chicken to brown other side. Broil for another 5 minutes until edges have browned. When done, add remaining liquid back until desired moistness is reached. Enjoy solo alongside beans and rice or over greens, or use for delicious tamales, tacos, burritos, nachos, quesadillas, burrito bowls, enchiladas and more. I would like to know where the nutrition information is for this recipe. I use a slow cooker all the time but use a pork loin and just let it cook for hours then use the meat in various dishes. There is a lot less fat with the loin than the pork shoulder but will definitely try this recipe with chicken. Great recipe but PLEASE… there is no such thing as “chicken carnitas.” Carnitas is pork.. always has been and always will be. Chicken Pork does not exist. Yes, The Mexican carnitas are pork, but for those of us who can not eat pork … this is a healthy option and they are delicious !!!!! do you have to broil the meet at the end? I’ve been making this for at least a year now…family favorite. I use 3 breasts for 2 adults and 1 teen and shred the meat. Definitely try to use the beer. I used to skip it but since I added it once, it was so good I always add it now. We use it for taco meat. Great recipe! Amazingly easy go to recipe. Bud light lime adds good flavor but chicken broth works too. 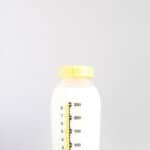 Cooling on low 5-6 hours is plenty, otherwise it gets too dried out. Also, I forgo the spice rubbing and dump all incredients into the slow cooker and it turns out wonderfully! Made this for a dinner for 20 people. Everyone raved about it. Didn’t have beer, so used chicken broth. Also, only had chicken breasts, and it still turned out great. Thanks for a great recipe! Did you add more cook time/how many chicken breasts did you use? Thinking of doing the same! What can you substitute if you don’t have beer? These look so delicious, but I don’t own a slow cooker. :( I do own a Dutch oven, though, and am wondering if you have any tips for cooking the chicken that way? This was so good and easy. And quite different from some other carnita recipes I found. I only used 2 chicken breasts and the same amount of liquid and it worked out perfectly as I didn’t want it to get to dry. Also, I only cooked it for 4 hours on low. Very nice . Used my pressure cooker, cooked in 30 minutes. I made this today for meal prep using only chicken breast and substituting broth for beer and it is soooooo good! Thanks for the awesome recipe which will now be in regular rotation! Smelling this all day was sweet torture. I used all breast meat (since that’s what I had) & it came out great. My only regret was the crisping stage got a little too crispy under my broiler. Will definitely make again, the flavors are so good. Next time I’ll be sure to drink beer the night before, reserving 1/2 cup, as I had to open a whole bottle at 10:00 this morning to make this and didn’t feel right drinking the rest at that hour. Love this recipe!! I knows that this is a slow cooker recipe, but I use my fagor 8qt pressure cooker and in 30 minutes from adding ingredients to table, it’s devoured I just follow the directions, put it all in my pleasure cooker, cook on high for 20 minutes and it’s done, shed the chicken fry it up add some juice, amazing thanks for a great recipe!! THANK YOU for a NEW family favoriute… OH. MY. SCRUMPTIOUSNESS! These were delish… I didn’t have any OJ, so I nixed that step… but man was this chicken flavorful! I could have eaten it all and not shared.. I will definitely be making again. Thank you!!! They were AMAZING!! It didn’t crisp up enough for my taste after 10 minutes (surprisingly). By family request, I’m making them again this week, and we’ll go for a little more crispy this time! Thanks for sharing! These look amazing! 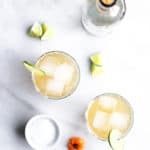 Quick question though, can I use orange juice made from concentrate for this recipe? 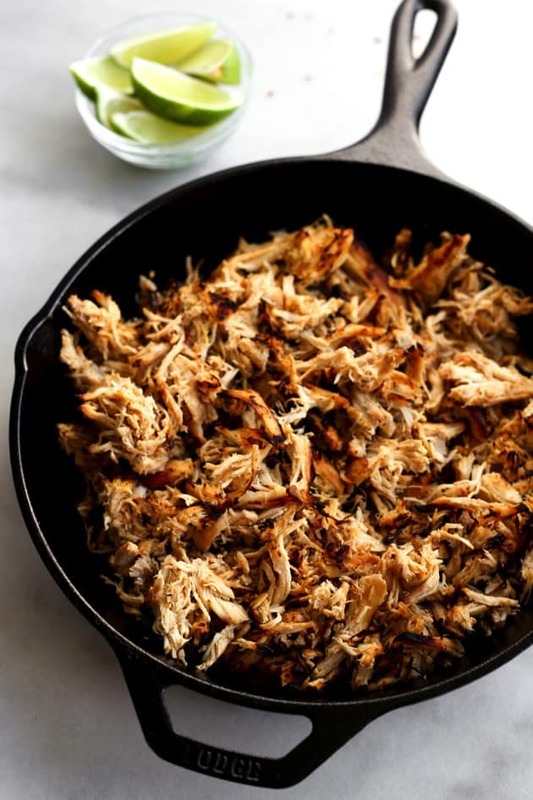 Just made this chicken carnitas recipe last night and TOTALLY loved it. I paired it with rice and black beans…pretty excited to make a fabulous Mexican meal that did not rely on cheese and tortillas! This looks delicious!! Since I’m new to the slow-cooker method, I was wondering if the chicken could be frozen??? I think it’d freeze okay–would probably be best in a quesadilla or a burrito after defrosting though. Would love to know if you try freezing! If you meant can you put frozen chicken in the slow cooker, then yes. I tried it today and it worked just fine. This. Was. Awesome. Just had it for dinner with some cilantro lime rice. Delicious and so easy. Love a healthy slow cooker recipe! About how many chicken breasts would you use for this recipe? Sorry about that! I just added the print button. :) Enjoy! Now this looks real good. I love chicken but I can do with out the chilies my family laughs we are Mexican and Italians and I can’t eat chilies of any kind hehe, but I don’t have a iron skillet I so have to invest in one. Thank you for sharing the recipe will be printing out. How sad that you can’t eat chilis! If you don’t have an iron skillet a regular old roasting pan would work too–though cast iron is amazing and not all that expensive. YUMMMMM… totally pinned this!! I need a slow cooker!! This is my kind of mexican!! I agree, who needs pork fried in oil?! 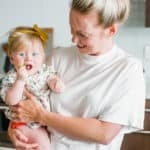 These photos look amazing and even though I just had dinner, you’re kind of making me hungry again! I absolutely adore carnitas!! Would love to give this version a try. slow cooker is seriously a life saver..i love easily, flexible meals such as this one..yum!